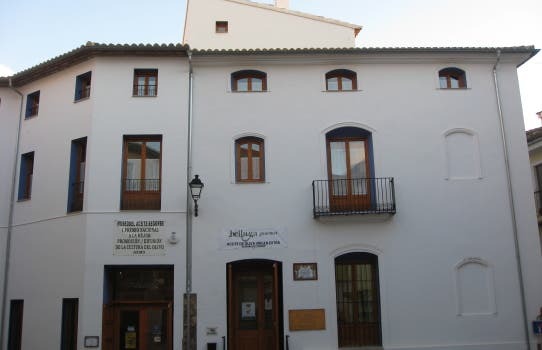 The Olive Oil Museum is located in the downtown of Segorbe, in an ancient mill for making olive oil that has been rehabilitated and it preserves many of its original elements that were used in the production of oil. In the ground floor there is an explicative audiovisual about the cultivation and harvesting of the oil, the different types of olives in the region and the elaboration of the oil. In the upper floor we find an oil waterfall, diverse explicative audiovisuals and a hall where we learn the history of Segorbe through La Morruda, a hundred year old olive tree. The museum has a store with ecological products. It’s an old olive oil mill that was restored in 2005 to become the museum that it is today. Original elements used in the olive oil making process were conserved and new audiovisual and touch screen technology, among others, have been added to compliment them. In the semibasement of this building an audiovisual display will explain the process of making olive oil, the classes of olives that are cultivated in the area, etc. On the main floor they show you the history of the region. In 2007, the museum was rewarded with a prize and the entrance fee is only dos Euros! This establishment was an old olive oil mill that has been explaining the historical importance of olive oil in the Mediterranean for over 5 years, since its opening. It shows both the traditional and modern processes involved in making olive oil. Additionally, there’s also a store where you can buy oil and other ecological products derived from it. They can inform you about other tours and guides throughout the city and its surrounding areas. Or, they at least did so in our case.